1. INSPECT PRESSURE SWITCH NO.1. 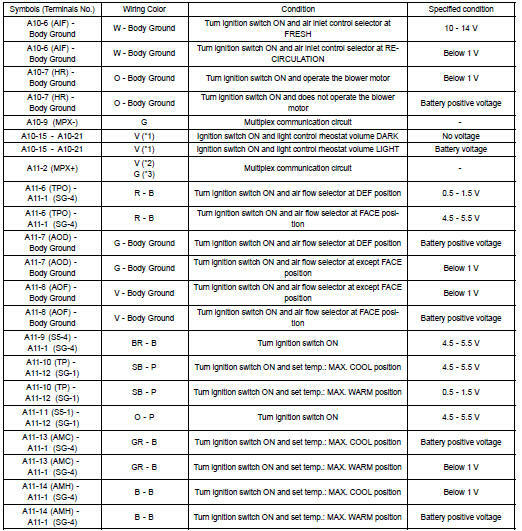 (a) Magnetic clutch control: Inspect pressure switch operation. Set on the manifold gauge set. Connect the positive (+) lead from the ohmmeter to terminal 4 and the negative (-) lead to terminal 1. 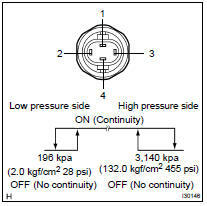 Check continuity between terminals when refrigerant pressure is changed, as shown in the illustration. If operation is not as specified, replace the pressure switch. 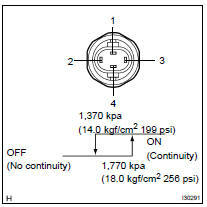 (b) Cooling fan control: Inspect pressure switch operation. Connect the positive (+) lead from the ohmmeter to terminal 2 and the negative (-) lead to terminal 3. (a) Disconnect the connectors from the A/C amplifier assy and inspect the connector on the wire harness side, as shown the chart. If the circuit is as specified, try to replace the A/C amplifier assy with a new one. If the circuit is as specified, inspect the circuits connected to other parts. (b) Connect the connector to A/C amplifier assy and inspect the wire harness side connector from the back side, as shown in the chart. *1:If the circuit is as specified, try to replace the A/C amplifier assy with a new one. If the circuit is as specified, inspect the circuits connected to other parts.